As promised, I’m bringing you the view from my office window. I work upstairs, and can look down into our back garden. And in the back garden is our new bird table. The star visitor there this summer isn’t a bird, it’s a grey squirrel. He comes almost every day to forage for bird food, and we love watching his antics. Yet if I’d posted these images four years ago, say during my last series of blogs, I’d have been committing a criminal offence and risking a £5 fine. 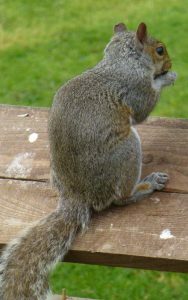 Grey squirrels were regarded as such pests that a law of 1937 required landowners to notify the authorities if they spotted one on their land. Amazingly, this legislation was only repealed in 2014. Well, I’m safe now. It’s a sort of game we play with our squirrel. He tries to snaffle all the bird food, and we try to stop him, which isn’t easy, because his gymnastics put Olympic athletes in the shade. Having a tail helps, of course, along with strong rodent teeth and a very persistent nature. 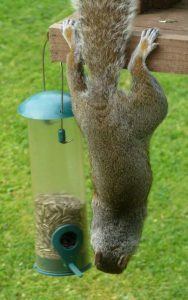 It took a while till we found a peanut-holder that he can eat from in small amounts, but can’t bite through to pinch all the nuts in one glorious binge. Now several people I’ve told about him have said, a touch wistfully, “Pity it’s not a red squirrel.” True, there are no red ones in our woods, or in most of Britain nowadays. Since the greys were imported (originally as exotic novelties) from the USA in the 1800s, they’ve flourished here and out-competed their red cousins. Not deliberately, but naturally, because sad to say they carry squirrelpox, a virus that doesn’t harm them, but kills the reds if they contract it. They’re also known to be destructive, stealing birds’ eggs in spring and chewing trees, sometimes destroying them. And probably most telling, the reds are prettier than the greys, and thanks to the likes of Beatrix Potter, they’re still thought of as our “natural” squirrels, while the greys are villified as “invasive non-natives.” Emotive language in this age of globalisation. All in all, I reckon they get an unjustly bad press. several other common wild creatures. Rabbits were brought here by the Romans, or if you think that’s too long ago to matter, how about wild muntjac deer, first imported from China early last century. Who cares? Should we condemn any creature simply and solely for not being a native species? I don’t believe so. Secondly, yes, the greys do steal eggs and attack tree-bark. The reds do this too. Indeed in the 1800s red squirrels themselves were regarded as serious pests, slaughtered in their thousands in woods and forests all over the land. Now they are rare, so it’s their grey contemporaries that get killed, and it’s justified “to protect the reds.” If all the greys were killed, would that protect the forests? I don’t believe so. So I’m happy to have a grey squirrel in our garden. He’s cute and resourceful, and he’s welcome. Am I right? Do have your say, and don’t forget that comments posted before midnight this Thursday automatically put their posters’ names into the prize-draw hat for a free book giveaway.